We are very fortunate to have a prolific spring on the property that supplies all the water we need. While we currently use petrol and diesel-powered pumps to move the water around the farm, we have always planned on using more sustainable methods.The first step is the installation of a water ram pump. Ram pumps work on the principle of harnessing the “water hammer” effect – when you suddenly stop a descending column of water, the force produced is much greater than the weight of the water alone. This force, when used in a cycle can pump water considerably higher than the level it starts from. 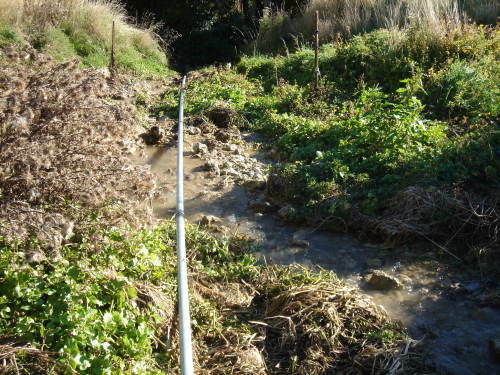 Water flowing downhill is passed through the ram pump and most of it is returned to the flow downstream while a small amount gets pushed up the hill. It’s inefficient but a small flow of water 24/7 using no external energy is a pretty good deal. Our ram pump delivers a constant 4L/minute to a header tank 40m above the spring. The ram pump before installation. It only has 2 moving parts (both valves) – one visible and one inside the base of the dome. Wikipedia has a good overview of the how ram pumps work. While there are plenty of references available online I was fortunate to get the original instructions with my ram pump. The ram pump installed at the lowest point I could practically manage – about 4m below the point at which the water is collected. To the right of the pump is the path of the spring. Water that sprays out of the pump as waste will drain back into the stream. I still need to put a cement base under the ram – it will be in danger of hammering itself down into the bank otherwise. The drive pipe heading down to the pump. It’s just over 30m of galvanised 40mm (inch and a half) steel pipe. There is a gentle bend in the pipe to get over some immovable rocks. The ideal is to have a perfectly straight, rigid pipe to minimise water friction but a gentle curve is better than sharp bends. 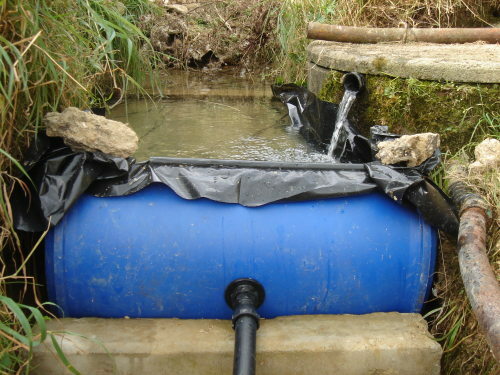 The reservoir at the top of the spring is made from a 200L plastic drum cut in half and lined with polythene. This ensures the drive pipe is always full and gives any sediment in the spring a chance to settle before the water goes to the pump. 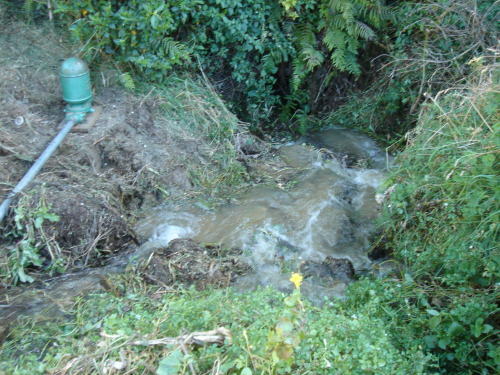 The inflow on the right is the overflow from the neighbour’s water catchment. While I mentioned there are plenty of resources online regarding hydraulic ram pumps, most are related to theoretical performance and pretty diagrams of how the pumps work. Here are a few lessons I’ve learned from trial and error (and wish someone had told me before I started). First up, and this is not a good thing to hear if you are considering “having a go” like I did, you have to set up the ram exactly as it’s going to be used in order to test it. As I will explain in the points below, there’s no dry runs, loose fits or shake-downs. Unless the ram pump is set up completely (and properly) it just won’t go. I spent a good number of frustrating hours trying to troubleshoot the operation of the pump before I realised this useful point. The drive pipe – needs to be as rigid and straight as possible. It must be airtight for the pump to work. I did a loose fit test with everything assembled and air was getting in the pipe. Water does not compress but air does. Air in the drive pipe cripples the pump and you will get erratic cycling or none at all. The reservoir – needs to have enough of a store of water to ensure air never gets in the drive pipe. The ram pump – needs to be level for the valves to operate correctly and efficiently. Installing valves on both the drive pipe entry and the exit to the delivery pipe is a good idea to save you having to refill these every time you fiddle with the pump. The drive pipe valve acts as the on/off tap for the pump. After all the planning, work (and a fair bit of swearing) I forgot to mention the absolute joy you feel the first time you see the pump cycling, delivering water with no external energy. You can get new ram pumps from Steve Miller Rural Services in Tauranga (07 578 3708). They are made from original castings I believe and go for $1500-$1900 + GST (that was pricing given to me 12 months ago). 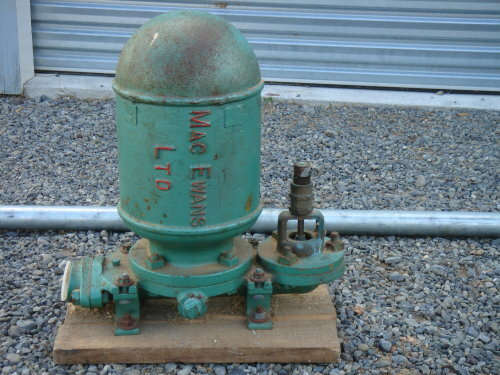 Luckily I got mine on TradeMe quite a bit cheaper than that, but even buying new it’s a pretty fair price for decades of free water pumping. HI THERE, I MADE A PUMP THAT WORKS PERFECTLY USING PVC PIPE AND SOME INLINE CHECK VALVES. YOU CAN MAKE THE PRESSURE CHAMBER FROM JUST ABOUT ANYTHING THAT WILL HOLD PRESSURE WITH A LITTLE INGENUITY. I JUST USED A STAND PIPE ABOUT 3 FEET LONG AND CAPPED IT. VALVING OFF AT BOTH SIDES OF THE PUMP DOES MAKE IT A LOT EASIER TO “FIDDLE WITH” IF YOU WANT TO BUY A WATER RAM PUMP TRY RIFE WATER RAM, I THINK THEY ARE IN PENNSYLVANIA, USA. and it worked the first time. I’m finally getting that little sip of clean springwater that I’ve coveted for years. I’m running using 2 check valves and a drive pipe. I skipped the compression chamber, at least for the time being, until something breaks. Thanks for the nudge. I got my hands on a Harrison & Sons water ram from Kerikeri, NZ. I was speaking to John there who said they have one operating to 1040 Meters!!. I depends on your fall I guess. I have a mate who has a home made one lifting water to 200m no probs. Just bought a Harrison pump, after a long frustrating search for straight answers. Most suppliers (including Harrisons, now called Alternative Enterprises) seem to publish figures in brochures, web sites etc then contradict them when you talk to them. And now the irrigation piping contractor is saying something different again! My site has ~20m supply head and I want ultimately to deliver water to about 90m above the intake, but I may settle for 67m or even 45m and then use a windmill or solar to reach the rest of the property. The challenge is that I have modest flow in mid summer, and the Resource Management Act rules restrict how much water I can take on any day, so I would like to pump on as many days as possible. I am interested in attempting to construct one of these. can you supply any pictures or metric specifications…. My Harrison pump with a 2.5m fall is lifting water to 52m; admittedly not much at that height but, as you say it is continuous. The pump has stalled lately after running so well for a time. The intake pipe has a right angled bend about 2m before the pump, in order to sit the pump on a suitable site. Do you think this significantly affects its performance in comparison with a straight pipe entry…? While a bend in the delivery pipe is not ideal it will diminish performance to a degree (but I couldn’t tell you exactly how much). A gentle curve will be better for maintaining good water velocity and reducing turbulence in the pipe. As for the pump stalling, you might want to check: twigs or debris can foul the check valve, air can get in through pipe joins if not tight and thread-sealed, any high points in the pipe can collect air if there are any curves on the way to the pump. I Have an Idea to trap the electric generator at the ram pump outlet side to generates the electric power. We have the same ram pump as yours on our property. The last owner could not get it to work. You said the that the delivery pipe – needs to be attached and be at the correct length and height. How do you calculate this? From what you have said I need to increase the reservoir size as well.